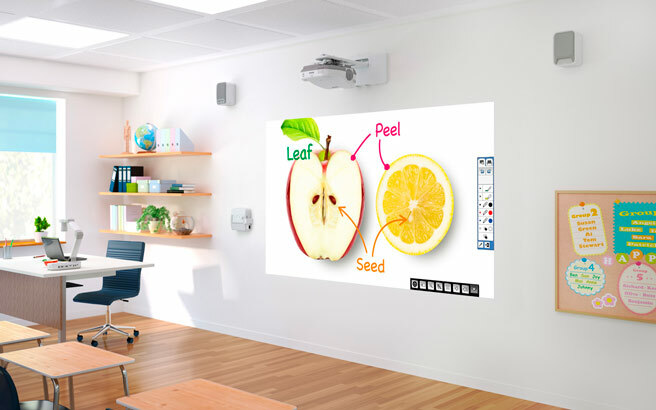 The EB-575Wi ultra-short-throw interactive projectors offer cutting-edge kinesthetic learning. 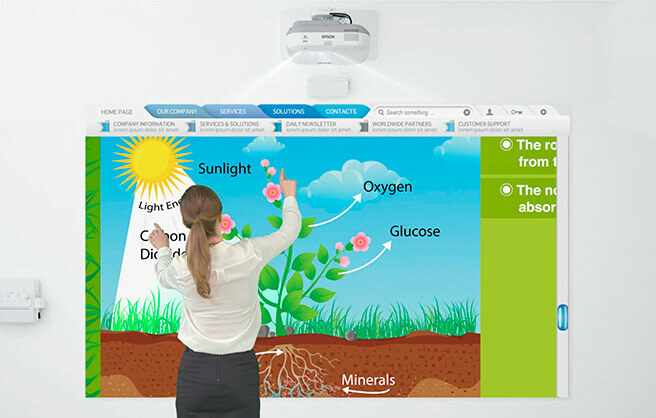 With PC-free interactivity, it's easy to annotate on displayed content from virtually any device, or no source at all. 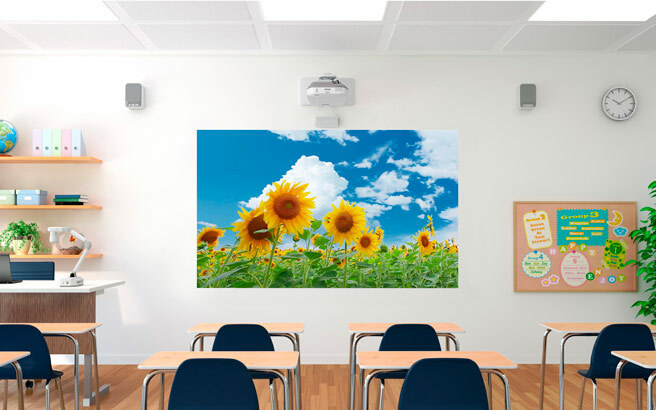 The EB-575Wi ultra-short-throw interactive projectors offer cutting-edge kinesthetic learning. 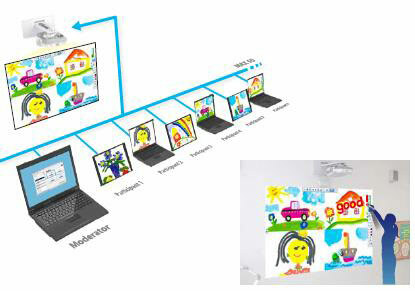 With PC-free interactivity, it's easy to annotate on displayed content from virtually any device, or no source at all. 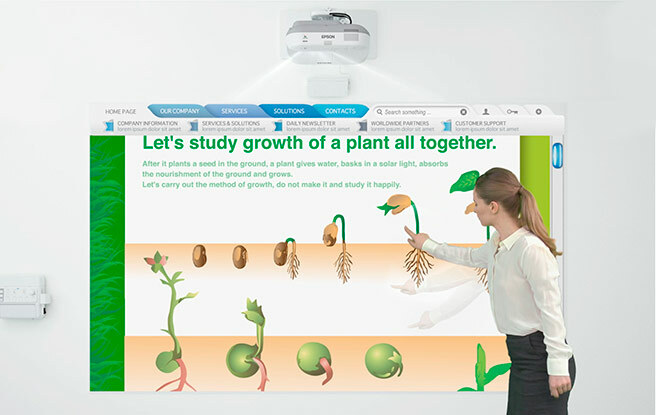 Teachers can wirelessly project from mobile devices, utilise popular learning applications, or use the Moderator software to simultaneously share students' work from PC, Mac®, iOS® and Android™ devices. It's all so seamless — kids stay focused with no downtime. 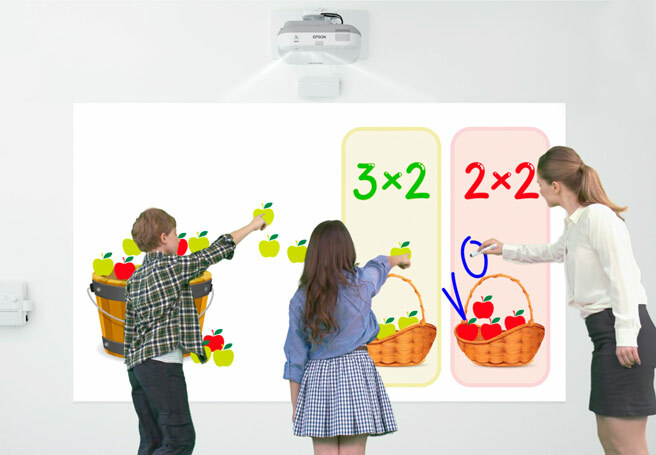 Offering 3x Brighter Colours than competitive models, Epson® 3LCD projectors ensure bright, vivid lessons. With 2700 lumens of colour brightness and 2700 lumens of white brightness, the 575Wi delivers truly dynamic images. Longer lamp life – Up to 10,000 hours lamp life in ECO mode. 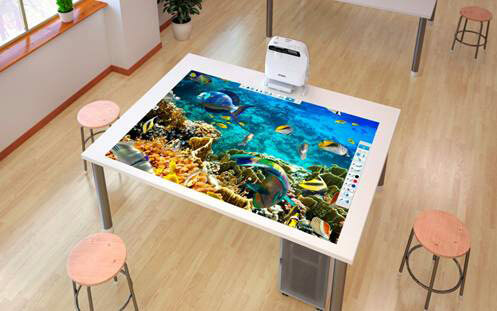 Find out how to set up your Epson iProjection app and learn more about your projector and device compatibility, visit Epson.com.au/iprojection. 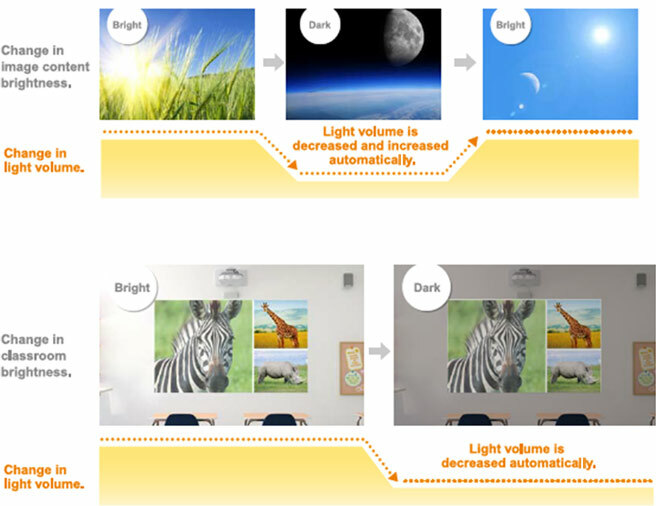 The long 10,000 hours lamp life# saves time and money by reducing the frequency of costly lamp replacements. When you do need to replace the lamp, it will only cost $79 inc GST. 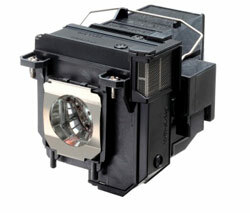 Periodic cleaning allows Epson projectors to be used for much longer intervals. 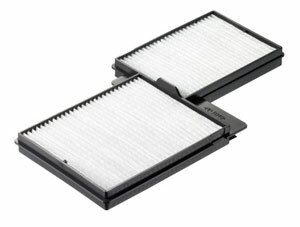 The maintenance cycle for the air filter is approximately 5000 hours. 7. Drawings or annotations can be saved as PDF, JPEG, BMP and PNG formats. 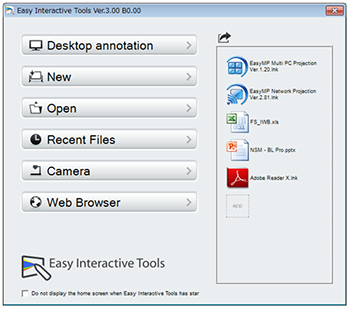 In addition, the updated EIT v. 3.0 software now also features an original file format (EIT) that allows re-opening and more editing options for saved documents. The higher response speed and accuracy makes drawing as immediate and responsive as using a pen on a whiteboard. Immediate and accurate calibration, all with the push of one button! 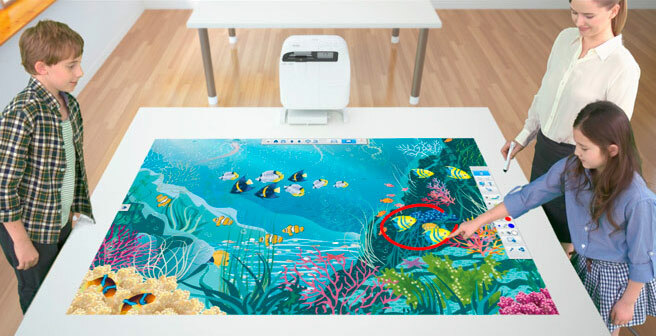 Since no drivers are necessary, you don't have to set up your PC before using the projector. 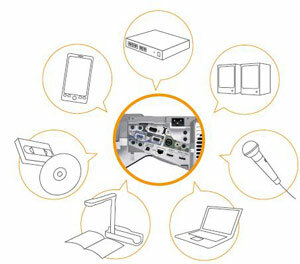 Simply connect any PC to start using the interactive functions. The new interactive pens have been re-designed to make it easier to hold and write than with a conventional pen. 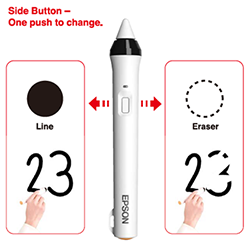 Now also comes with side button with selectable functions such as open tool bar; switch between mouse and pen or switch between pen and eraser. In addition to interactive pens, it is now possible to operate intuitively by using your finger on the screen - now you can annotate, open and close files, scroll through pages, move and enlarge objects. 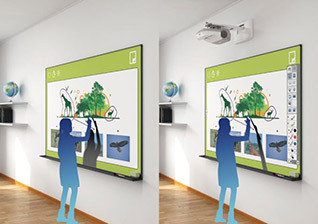 The Multi-PC Projection feature allows a network of up to 50 PCs to be connected to a single projector. 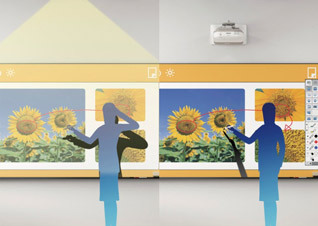 The newest version of this feature allows a host PC to act as a Moderator who can then select up to 4 of the connected devices to be projected on the screen. It is also possible to annotate on the screen image. 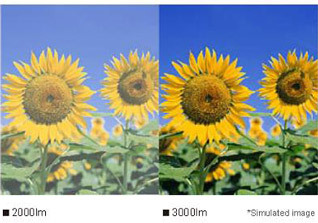 The Moderator function allows the user to control what image is projected on the screen and prevent tampering. Two people can write simultaneously on the interactive area using 2 pens. 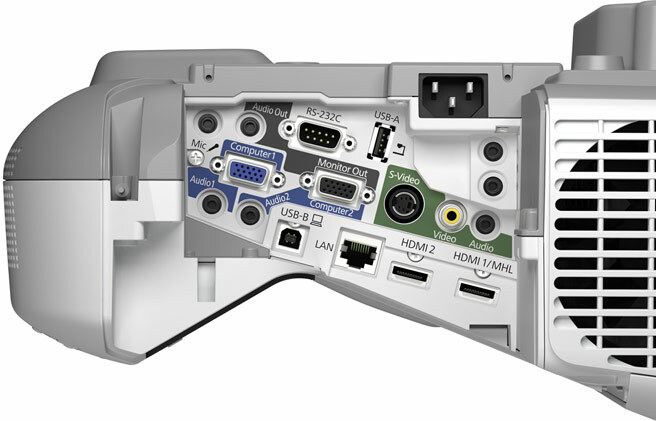 For the EB-595Wi model with finger touch interactivity, users can annotate on the screen with pens or a combination of pens and fingers. Basic projector operation (power ON, source change, volume up/down, A/V mute, etc) can be done by simply clicking the icons shown on the new operation toolbar. 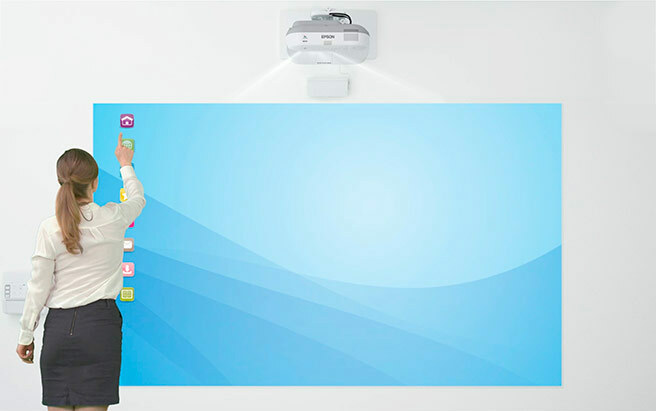 Now there’s no need to look for the remote control, when the projector can be easily operated from the screen! 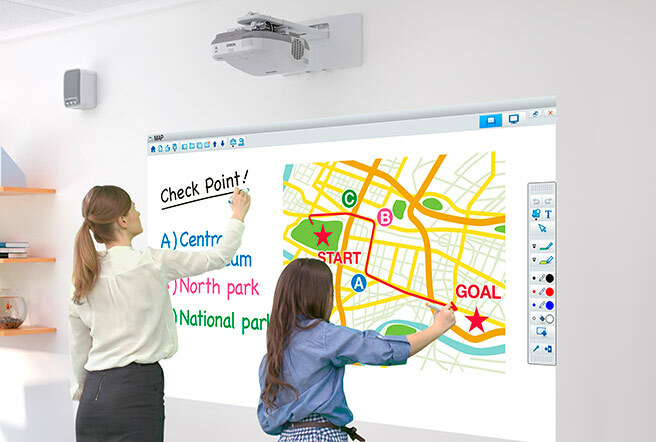 Interactive functionality is also available without a PC connection, so drawing on the projected screen is now possible when connected to other devices such as document camera or DVD player etc. Even when there is no input source, you can annotate on the screen like a whiteboard. 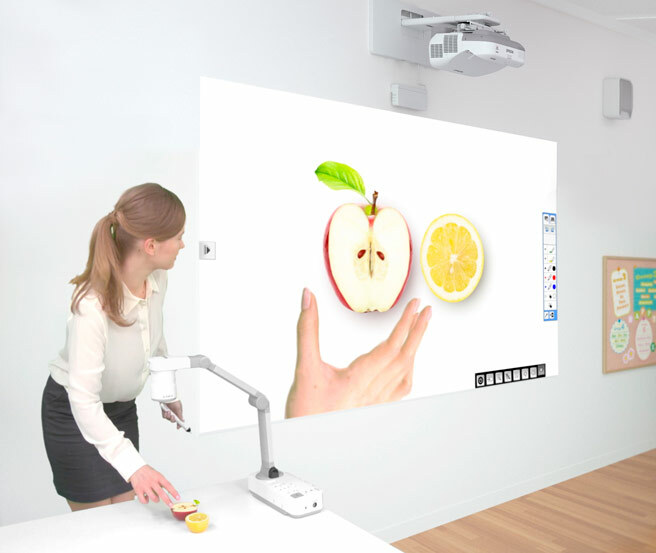 These projectors can also project vertically downward, enabling users to transform any table top into an interactive surface By utilising the optional ELP-MB29 table mount, an ordinary table becomes an engaging platform for interaction and collaboration.